November saw stocks get chopped like a turkey that stuck his neck out. That left a lot of U.S. stocks on sale. But to get the biggest bargains — and potentially the biggest bounce — you’ll want to look beyond Wall Street. In fact, you’ll want to look beyond U.S. borders. Here’s what I mean. 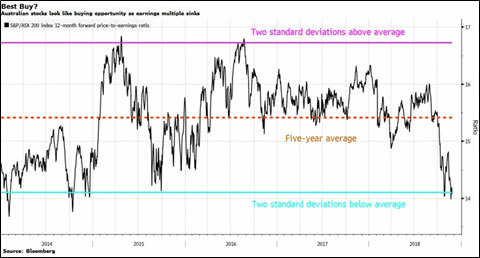 The MSCI World Index started Monday at its cheapest price-to-earnings ratio in more than five years, trading at less than 16.4 times earnings. Now, you could buy that global stock market with the iShares MSCI World ETF (NYSE: URTH). It tracks the MSCI World Index closely enough. And the average trading volume isn’t bad, at more than 62,000 shares per day. But what if you wanted the BIGGEST bargains? Then, my friends, you should look to the hidden value Down Under. I’m talking about Australia. Australia is a world away. And it’s a continent bristling with mining stocks, oil companies and more. So, if stocks are poised for a rebound, then Australia should make the most of the fact that commodities are trading close to a 17-month low. Commodities as a group got hammered by A) fears of a worsening trade fracas between the U.S. and China and B) plunging oil prices, which slid down a well-greased slope as Saudi Arabia cranked up production to its highest ever. Saudi daily output reached 11.2 million barrels a day recently. The Saudi surge is coming two weeks before OPEC meets in Vienna. I’m pretty sure the Saudis just want to remind the rest of the oil cartel who the big dog is. And this raises the odds we’ll see an OPEC oil production cut come out of that meeting. And that will provide ANOTHER boost to not just commodity prices, but also Australian stock prices. Now, let’s look at a third boost for Australian stocks. They are just so darned cheap. Look at this chart of the forward price-to-earnings ratio of the S&P/ASX 200 Index. Not only is the S&P/ASX 200 Index trading at just above 14, which is dirt-cheap. This is well below the five-year average. Heck, it’s two standard deviations below average. Why? Because as is often the case, when markets get squeezed, stocks on the margins get squeezed the hardest. There are no certainties in the market. But the odds favor a rally in Australian stocks. So, how can you play it? 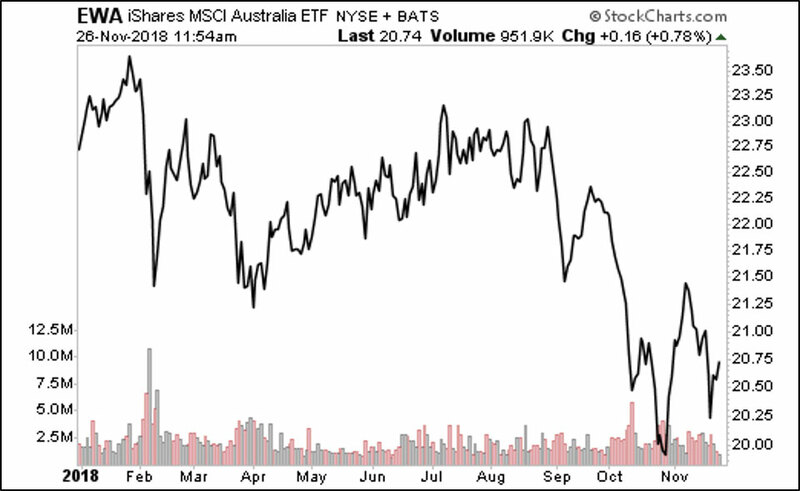 Consider the iShares MSCI Australia ETF. It’s about 9% lower for the year and more than 12% off the high it hit in late January. 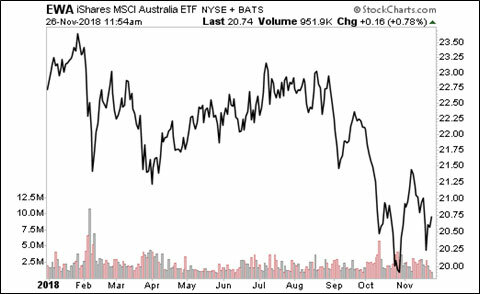 And with daily volume of more than 2 million shares, the iShares MSCI Australia Index Fund (EWA) is plenty liquid. You can buy it easily, and more importantly, sell it when you want to. Do your own research before buying anything. But if this rally has legs, Australia will be in the running. You might want to gobble this one up before it gets away.